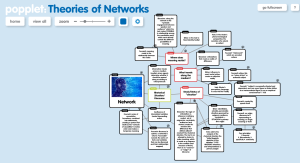 Since the embed code that worked last week isn’t working today (a change to the network was made by WordPress and now ShockWave isn’t playing nicely, apparently), here is a screenshot of the interactive Popplet. Clicking on the image will take you to the Popplet where you can move around. But perhaps, like the Talking Heads, and even Mssr. Foucault, it isn’t the destination, but the representation of it that is what it is, that makes meaning. And, if I believe Mssr. Foucault, then my concerns about the beauty of my map and what it says about the state of my mind are unfounded, since it isn’t designed to represent any other thing or idea, but as itself, nor is there authorial intent or authority. I am liberated from my “empirical consciousness” and instead an agent of the discourse. I totally forgot to do the mind-map updating amid the various nodes of work this week. This one got left on the periphery, not fully connected to the system I interacted with. I added some nodes related to Foucault and connected them to the others: Foucault connects to Biesecker, but refutes Bitzer and Vatz. I’m beginning to use the terms “discourse” and “network” interchangeably, perhaps poorly. We shall see.